This review for GoodSense Clotrimazole Foot Cream is to give an educated review to prospective customers about the feasibility of using this product. The product aims to cure athlete’s foot as well as ring worm and jock itch. The pain and irritation that are a part of these infections are also cured by the application of this cream. It is available on only two websites, Amazon and Factoryotc.com. Read on to know more about how the product works and the ingredients included that are used to treat Athlete’s foot. The active ingredient Clotrimazole helps in relieving the itching and the rashes that are caused by athlete’s foot. It is an anti-fungal ingredient. In order to apply this cream, the affected area should be clean and dry. One should apply a thin layer on the affected area twice a day, preferably once in the morning and once at night. For ringworm and athlete’s foot, one should apply this cream for four weeks, while those suffering from jock itch one should use it every day for two weeks. In case the problem persists it is advisable to consult a doctor. On Amazon it is priced at $7.52 and on Factoryotc.com it is priced at only $1.53. On the product’s website, in the FAQ section, it is mentioned that their products are cheaper than other similar products. There is a difference of %36 when it comes to the prices. There is no guarantee given by the manufacturer for this product. There are no customer reviews given on the product’s website. On Amazon the reviews are positive, stating that for some it worked instantly and for some it took time to work, depending on the severity of the condition. GoodSense Clotrimazole Foot Cream has good customer reviews and provides a detailed list of ingredients that it uses as well as gives directions on how to use the cream to obtain the maximum results. The manufacturer mentioned on their website that they are offering this product at a lower price than the brand names that are available over the counter. However, there is no manufacturer guarantee and there are no warnings or side effects that have been mentioned. It is advisable that a prospective customer should first consult a doctor before using this cream as it may contain ingredients that might not be suitable to one’s skin and can cause further damage. The bottom line is to use this product after doing a thorough examination of the ingredients that are used. 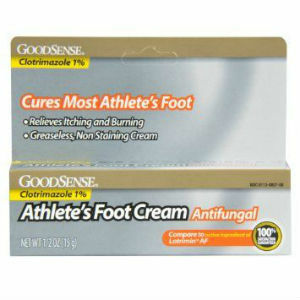 Jimmy Rodriguez	reviewed GoodSense Clotrimazole Foot Cream	on November 19th	 and gave it a rating of 2.5.